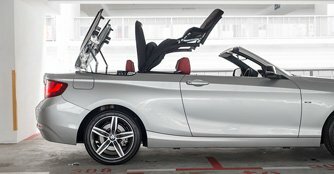 BMW's 2 Series Convertible will satisfy driving enthusiasts every time they get behind the wheel, yet it is comfortable and easy for everyday use. Convertibles are all about enjoying the sun on your face and the wind in your hair. They come in a range of sizes, from small cars to supercars with seating for two or four, and buyers can choose between models with conventional soft-tops or retractable hard-tops. Introduced at last year's Paris Motor Show, the BMW 2 Series Convertible joins the 2 Series Coupe and Active Tourer front-wheel drive compact MPV in BMW's new and refined premium compact lineup. The third variant of the 2 Series range has some big shoes to fill: more than 130,000 units of its predecessor, the 1 Series Convertible, was sold worldwide, making it the most successful car in its segment. Thankfully, BMW didn't mess with the winning formula of the 2 Series Coupe too much, basing the 2 Series Convertible on the solid bones of its coupe sibling. The classic long hood, short overhangs and set-back passenger compartment give the 2 Series Convertible a sleeker look than its predecessor. With the top up, the car faithfully mimics the three-box stance of its coupe sibling and strikes a rather formal profile. One particularly neat design touch is the crease on the shoulder line of the car, which starts just behind the front wheel arches and runs all the way around the back of the car, helping to increase the car's visual presence. And with the top down, we like the way the shoulder line blends into the soft-top storage compartment, providing the familiar 'boat-like' profile that contributes to the style icon status of Bimmer convertibles. Standing at 4,432mm x 1,774mm x 1,413mm (L x W x H), the 2 Series Convertible is 72mm longer, 26mm wider and 2mm taller than the old 1 Series Convertible. It is also just as long and wide as its coupe sibling, but 5mm lower.